Very interesting post: there are a number of pearls that I will be taking away from this. Thanks Phil and Grateful to have had the opportunity to share this with everyone. Have an Amazing Day. Amber, thanks for your reply, the exuberance really made me smile. Yes, I agree there is definitely something special about meeting someone face-to-face compared with virtual interactions. Thank you for sharing this post, I hope it is able to add value to your community. Christine. Thanks for the kind words Amber. You know it more than anyone that belly to belly, nothing like it. As a former anti-networker, I totally get this article now (I wouldn’t have gotten it a couple years ago). Everything really comes down to people. Your income comes down to people, your business, your friends, everything comes down to networking with people. Great article. Would love to know exactly how you use hash tags (in twitter only?). Thank you! Happy to spend a few minutes if you’d like. 10 minutes and you’ll be set. To summarize though I use #’s to search around topics or tweet around keywords I want to be associated with. ie: Looking forward to #NMX2014 or Loved #EOF Podcast today. Now anyone searching the #NMX2014 can see my comments also and connect with me. I couldn’t agree with you more! Along with actual networking events, I try to use some of these strategies as I travel to work conference and meetings. What do you think about a 20-30 second follow-up video inside your email? I’m thinking about doing that but not sure if that’s crossing into that creeper stage. Definitely don’t want to be there! Ha. Collin love video. The one concern though in email is many times you can end up in a spam filter. I like quick follow-ups with a scheduled call or meeting to further relationships when possible. I Love it! Never in my life did I think I would see a step by step guide to networking! Brilliant! Some of it seems like common sense but not something we usually do so just filling in those gaps and having it in this format really helps bridge that gap from good networking to great! If you are going to network you may as well do it right! I truly believe that business and life in general are a “team sport” kind of hard to make money without the help of anyone. It’s not always about what you know but who you know! Great post Mike and Christine! Nailed it! Thanks Justin and definitely a team sport that is helped by who you know. Gary Vaynerchuk had a great write up on LInkedin the other day saying he wished he’d used mentors more when starting out to propel success faster (if possible) and having a good Network can help with that for sure. 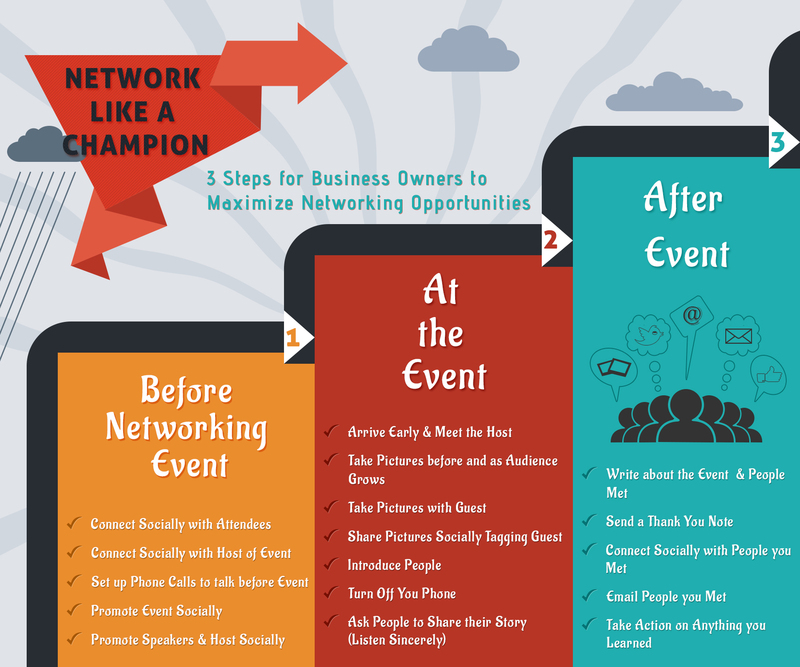 Really like the 3 step process to maximize networking opportunities. Belly to belly for me is the best. I can really put my attention to the person face to face. It’s the event after the event where the party gets started 🙂 The graphic you provided is way cool. Thanks for taking the time to do that. Eric, I agree Michael’s graphic is cool! I’m glad you like it. I think the three step method is great as there is a tendency to either over complicate networking or simplify it to a point where either steps 1 or 3 (or both) are omitted. Thanks for taking the time to comment. Always about the After Party 🙂 Appreciate the comments on the graphic. I’m an image guy personally, thus I like including in post. Such a powerful tip, thank you Mike! I really like asking that question you presented to further expand your network in such a meaningful way. Naturally when making a connection for them too, it’s a win-win and really starts to multiple. Who is the biggest name you have received back in return for asking someone that question?! I’m so curious to know! I sincerely ask with looking for nothing in return. This weekend I had the awesome opportunity Dean to Mentor at LeanStartup in NYC and met some amazing mentors and sponsors of the event. Posing this to one person I didn’t even know was a big sponsor. This has led to some nice discussions this week and will see where it leads. They say your network is your net worth ….so true. So agree that your network is your net worth. What an opportunity to mentor at Lean Startup. Let us know where it leads. Great post Michael! My favorite part of networking is meeting new people. I enjoy the connections and learning about them and how I might be able to help them. Great tips on following up after the event and the is definitely a topic that I need to work on more. Thanks again! I agree with the “give 110% of yourself”. This is about connecting humans! Along with that, I like to also go to each networking event with a specific goal (as opposed to business agenda). Examples of goals would be: find others interested in forming a meet-up, get feedback about an idea I’m working on, identify impactful folks to interview, etc. Inevitably people ask me how they can help and if I have a clear goal in mind, as opposed to blabbing about the ten irons I have in the fire, We have valuable conversations and I benefit greatly from it. We want to help each other and if we can make it easy for others to help us, it is very beneficial. Thank you! Melinda, you make a great point about specific goals helping us to get the most out of an event. While we must remain open to the opportunities that people bring, having clarity about what we stand for and where we are going in our business and what would help us get there is vital. Love this! Speaking of After party? How fun is the FireNationElite party in Vegas going to be? If you aren’t going…come on, it’s gonna be a blast! GREAT work here Mike and Christine…Love to see the collaboration! Thanks John, Your comment means a lot. Unfortunately, I am unable to make it to the Vegas party. Would SO love to be there, but its just not possible. Collaboration is the best. Next week, its the amazing Dean Patino of The Top 5 Percent Income. What a great piece!! I absolutely love the infographic at the end and have saved that in my Evernote for future reference. Again, I love this piece! Keep it up. “Alcohol beats email” what a great quote! Glad you found the article and infographic helpful. Love this subject. I get inspired by going to conferences and networking. Your question is a great suggestion I find ways to help people and connect. I really like the idea of asking someone you meet about who would make a good referral for their business. A great way to get someone to remember you is to do a helpful favor like referring a client. 🙂 It’s like how the way to get people to think you are a good conversationalist is to be a good listener. It’s a wise idea to listen, and think about what you can do for others rather than talk talk talk and think only of what others can do for you.